I auctally have a few concrete desk posts that I had from a pergola thing I built but took down to move to the new place, so I already have the concrete and 4x4 to make posts. I auctally sent a email to Kevin @ African-cichlid.com and have based my current plan on his suggestions, with some tweaks using material I have on had. What my current plan is to make another 2x10 beam that will span the center of the room, with 4x4s on cement post bases with a adjustable base on top to make sure my new beam is nice and tight. once this is done I need to move onto the sump system. I plan to run either sumpless till I finish the new setup or my current sump setup if I can save the plumbing. I'm thinking of during a bean animal with pipes coming from behind and use my current corner overflows as the drains. 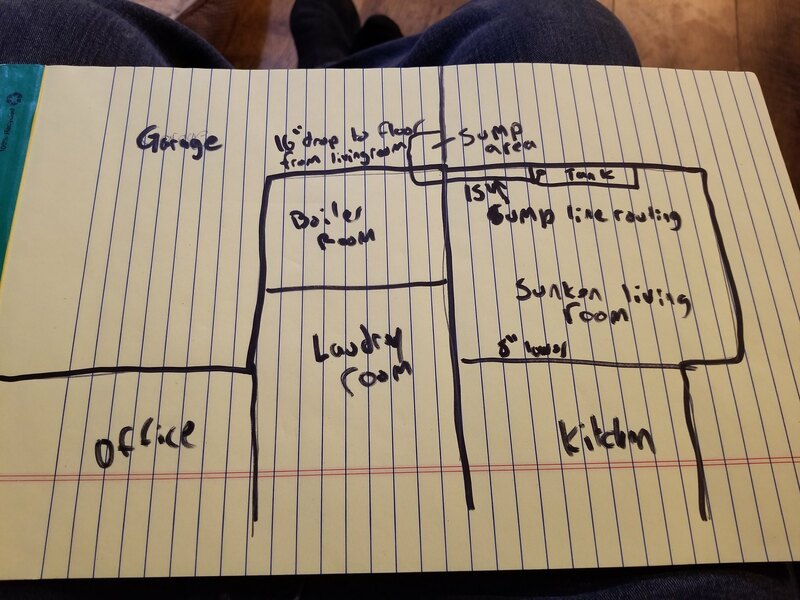 Am I correct in assuming as long as my sump is lower then my lowest drain in will drain? Total overkill in my opinion but if it helps yeah sleep at night why not. Am I correct in assuming as long as my sump is lower then my lowest drain in will drain? 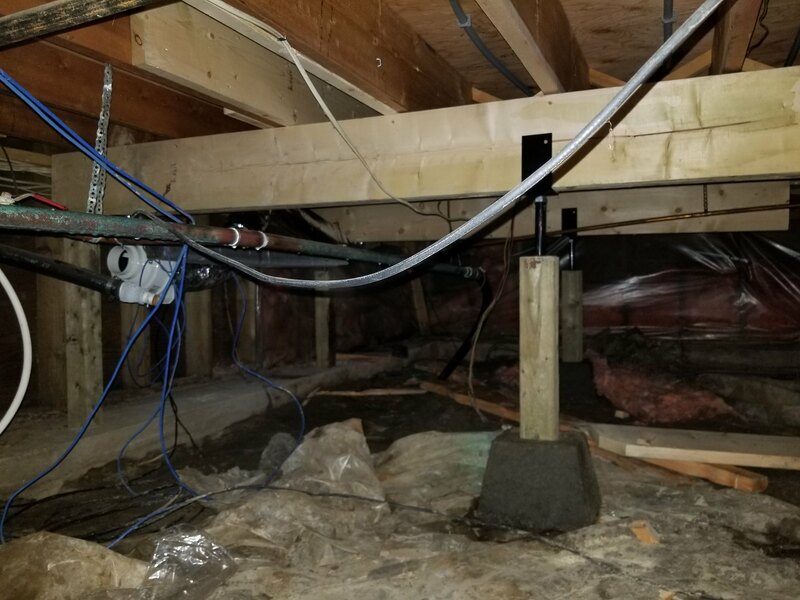 Yes water will always find a level and it will drain if it is lower, however as I stated before when installing drainage you have to maintain a minimum of 1 to 2% over the entire distance. If there are any low points there is the potential for debris accumulating and eventually blocking the line. Blocked line = wet floor. A 1" main line and a 3/4" backup line will not move a lot of water if you only have a 1% grade. What the distance and we can calculate out the minimum elevation change required? If you really want a sump in the garage, a 1' drop and 8' away means you'll need about an 8" drop. More is better. 1/8" per foot is close to code but I prefer to go overkill. The bottom of your drains need to be, in this case, at least 8" higher than your planned sump. If you can, put your tank on a taller stand. I was having flow issues with my old setup. In my case, my drain pipes were too small @ 1"
My bulkheads used to be 30" from the floor and now are 40". I run at least 6' long and use 1-1/2" pipe. Everything has been great for nearly 3 years now. As for your structural stuff, if you're going to put footings down in the soil, you'll need to dig down at a minimum of 24". 12" is for the footing and another 12" is to clear the frost line. In my opinion it's not worth it. Don't use jacks without a proper concrete footing. It will fail with frost heave if you don't dig it down and pour a proper bed. Sistering the joists is a good enough plan as you won't get much deflection without them, so I don't see much floor movement once you add material. Ensure you sister properly. Both sides of each joist need material, and go 100% past your required area. Use glue and decent screws and leave it alone for a few days to dry. I'll bet sistering is all you need. Last edited by gregzz4; 01-10-2019 at 03:31 AM. I haven't had any air issues in my drains. Once the air in my lines flushes it's done and dead quiet. And that's running 1-1/2" plumbing with an Eheim 1262. My return line is 1" and splits into 2 x 3/4" loclines. Once my main flushes itself, it runs dead silent. My tank is surprisingly quiet. I've worked on things to make it quiet with padding and such. Anyone who's been here buying corals can tell you, and there's been dozens of peeps. Don't worry about drainage noise as long as you set up your drains properly. We can help you work on that later. 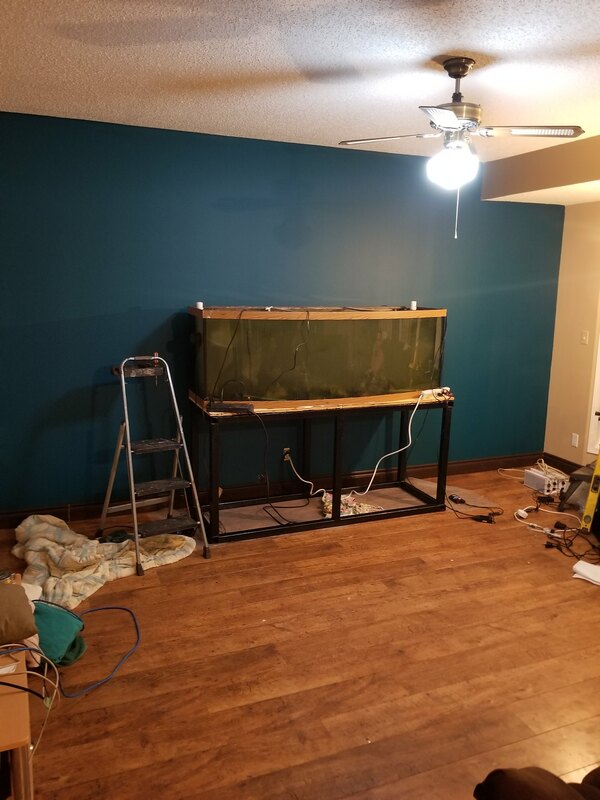 Get your tank in place and we'll work on the other stuff later. Well got the beefing done yesterday and tank moved today. I'm still a little concerned that when you jump in front of the tank or walk really heavy I see some water movement.